By Karen A. Mann. 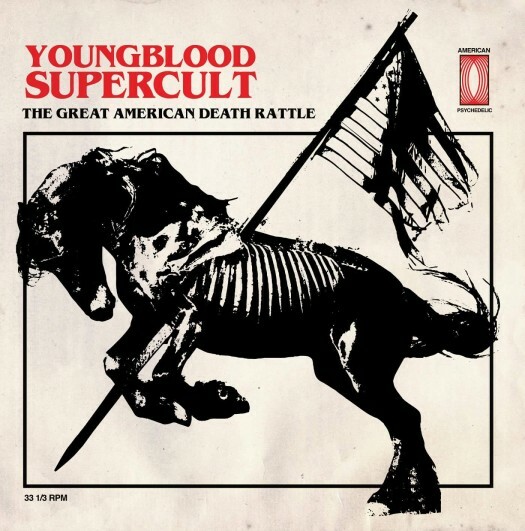 Listening to The Great American Death Rattle, the third release from Topeka, Kansas, quartet Youngblood Supercult is like stumbling across an old T shirt from a long ago rock festival from the ‘70s. Listening to The Great American Death Rattle, the third release from Topeka, Kansas, quartet Youngblood Supercult is like stumbling across an old T shirt from a long ago rock festival from the ‘70s. You know, the type of show that would have been labeled an “All-Day Super Jam” and would have involved copious amounts of weed, Budweiser and beautiful girls in cutoffs and tube tops. Black Sabbath, Blue Oyster Cult and Black Oak Arkansas were probably on the bill. Finding that old shirt won't necessarily bring back memories-- they're too hazy-- but it will bring back a feeling that you had a good time, even if the day ended with you puking in the parking lot. If Youngblood Supercult had existed then, they probably would have played that festival, too. Their hazy take on heavy blues -- mixed with a generous dose of English doom and Southern rock -- would fit right in with the era’s best classic rock bands. The band’s debt to Sabbath is obvious. Guitarist Bailey Smith has spent a good amount of time worshiping at the Church of Iommi with a few side nods to Robin Trower. Still, they sound less retro than simply familiar, like a song you loved years ago, but whose title you can’t quite recall. Youngbood Supercult delivers on that early promise with The Great American Death Rattle, the band’s second release with vocalist David Merrill, whose high, lonesome voice contrasts nicely with Smith’s impressive sludgy riffing. Blasting through nine songs, the band alternates between head-bobbing slow-burners and revved-up ragers. Even when the songs are bathed in a gauzy echo, drummer Weston Alford and bass player Brad Morris keep the groove earth-bound and on-point. There are no bad songs on the album, but at least three are true standouts. The first is “Draugr,” a plodding, ominous tale that includes some of Merrill’s most creative lyrics, in this case about an undead mythological creature. As ancient graves become no more. Delight in that horrific sound. As blood flows from perdition’s gate. Immediately after “Draugr” is “Wormwood,” a rager with riffs as expansive as as a wide-open sky. The Great American Death Rattle ends with the album’s best song, “Sticky Fingers,” which extols the virtues of the sweet leaf with a fuzzy, chugging riff and Merrill’s most soaring vocals. And finally my eyes can see. With The Great American Death Rattle, the band makes a pretty significant leap forward in their songwriting, musically and lyrically, resulting in one of the best releases of the summer. It should be no surprise that Youngblood Supercult was invited to play this year’s Psycho Las Vegas, the modern heir to the debauched rock festivals of yore.